No longer the only burger joint in town... but it does do a fine milkshake. 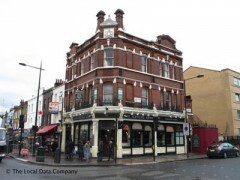 About: The Oxford Arms serve a variety of traditional pub meals which are available to eat in or take away. They also provide a wide range of entertainment including a juke box, fruit machines and Sky Sports showing major sporting events. They also have a beer garden. "No longer the only burger joint in town... but it does do a fine milkshake." There was a time when this reviewer believed that Ed’s Easy Diner was just a genial family burger business, striving to recreate the good old days of the American dream – in London. But those times are gone since research led to the realisation that the chain has diners up and down the country. Shame on me. Anyway, we’re here to talk about what was/is the original for us, the Ed’s at the end of Old Compton Street, for it was here that we discovered the chocolate and peanut butter milkshake. Set up around a colourful counter, with high chairs, jukebox slots and squeezable red tomatoes everywhere, Ed’s is everything you want from a classic diner. There may be a semblance of pastiche about it but what retro product is ever without its issues? Serving burgers, hot dogs, beef chilli fries and fried chicken, this diner has all your fast food needs covered. The burger patties are tight, thin, grilled beefcakes that have a reassuring grey juiciness running through them - none of this medium rare guff. Ed’s Easy Diner still acts like the influx of American food trends hasn’t happened. It closes its eyes and covers its ears and hopes that the Meat Liquors and Shake Shacks will go away. But they won’t, Ed. They won’t. This isn’t to say that the burgers aren’t tasty. But London has options now and Ed’s doesn’t have the authenticity – imagined or otherwise - of a Johnny Come Lately pop-up burger joint using highly flavoursome aged beef chuck between its buns. What it does do well is the shake. We’ve fawned over the chocolate and peanut butter Ed’s Easy Diner shake for over a decade and it still makes us weak at the knees. Plus, you can add yourself a scoop of Ovaltine and you’ve got yourself a malt. Sadly, this seems to have ended up being a celebration of the Ed’s Easy Diner of old. But perhaps now it truly is authentically retro? These days burgers don’t need the Americana shtick to sell, they’re a delicacy. But despite this, Ed’s Easy Diner on Old Compton Street remains an experience. Monday night quiz is awesome, banter and beer, great place to watch the footie, good outdoor area too, a busy place best visited after the tourists have gone home to bed.